Enter the discount code JULPROMO to enjoy this beautiful nailart at a 40% off on top of the on Sales Price. Limited set only! Grab this promo now by simply click on the BUY NOW button! 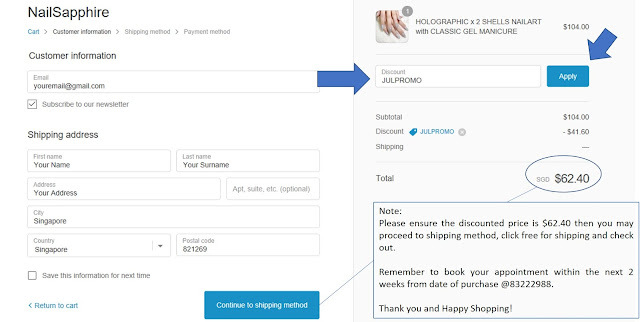 Follow the step and ensure that the promo discount code JULPROMO is Apply! Enjoy your shopping and see you soon! NailSapphire is a homebased Nails Salon located in a humble unit @ Punggol Sapphire @ Punggol Field. For manicure and pedicure services, contact Lenette @ 8322 2988. © NailSapphire All Rights Reserved. Picture Window theme. Powered by Blogger.